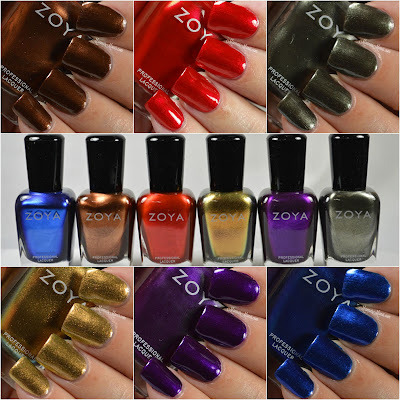 Zoya is releasing 2 beautiful collections for fall. 6 creams and what I'm going to show you today, the 6 metallics! Check em out. 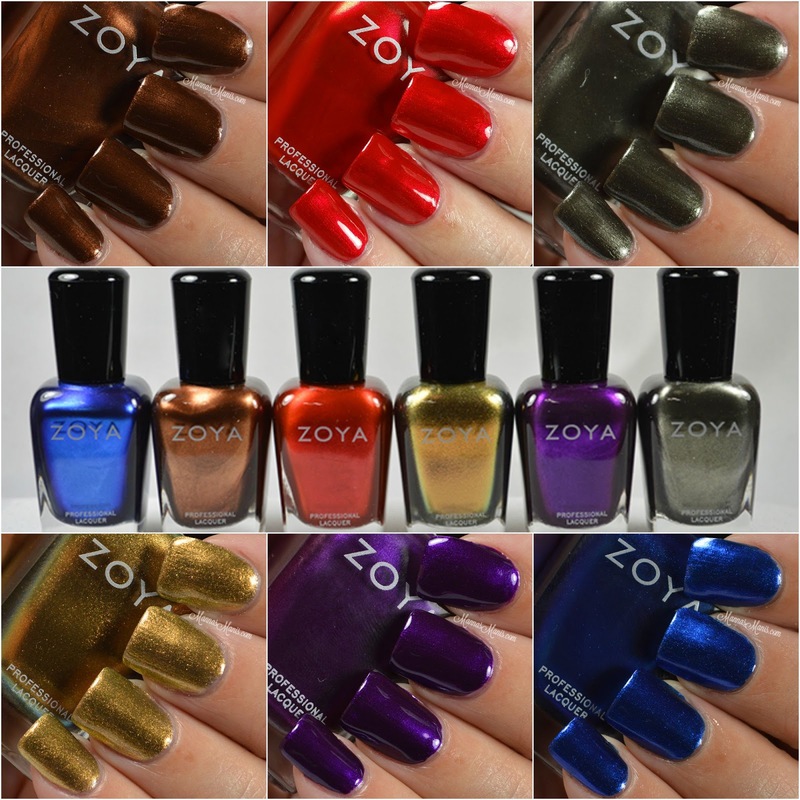 From Zoya: "Six, jewel toned liquid metal shades. The unique, micro-grind metallic pigment of the Zoya Flair Collection is fully blended into a vibrant base, creating the effect of brilliant colored melted metal!" *Note: All are topped with Out the Door top coat and pics are taken inside in a light box. Macros taken in direct light. 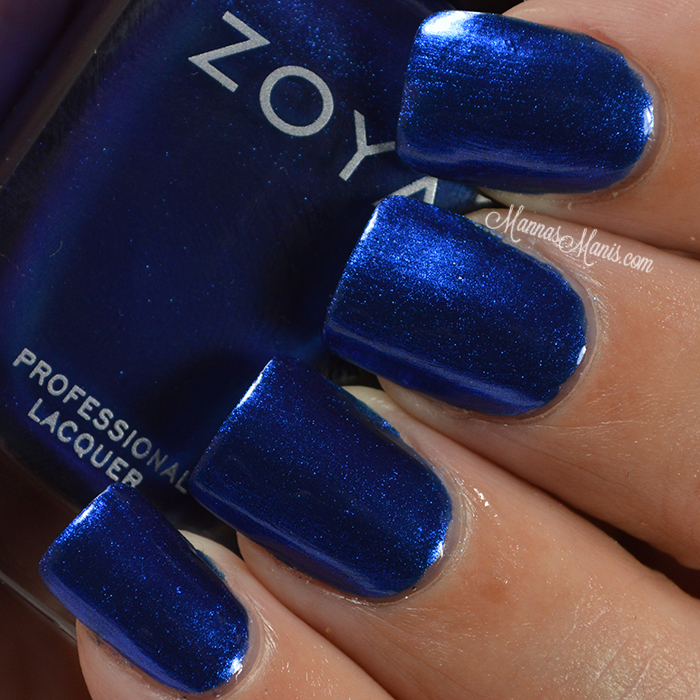 Estelle is described as a blue on blue liquid metal with a blackened base. Formula is good, application was patchy at 1 coat but levels perfectly after 2 coats. Cinnamon is described as a classic bronze liquid metal. Formula and application was the same for this one as it was for Estelle. 2 coats. Tris is described as a blackened, brushed nickel liquid metal. Application was very patchy at one coat, levels nicely after 2 coats. Aggie is described as a gold holo-flip, liquid metal with bronze micro glitter. Sheer enough for layering with one coat or fully opaque in three coats! This is by far my favorite from the collection (besides the blue of course.) Formula was a tad bit thin, but manageable. 2 coats. Giada is described as a purple liquid metal with a hint of fuchsia pearl. 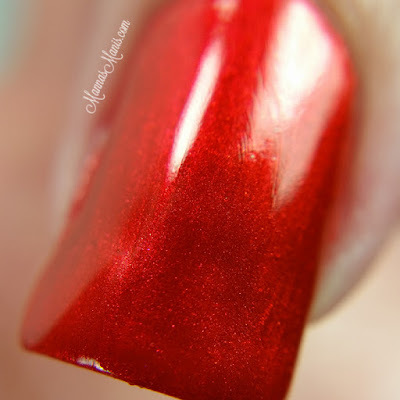 The shimmer in this one is astounding! It's nearly a one coater as well. 2 coats here for levelness. Ember is described as a deep, fiery red liquid metal with enough blue to be wearable for all skin tones. The thing I was most excited about with this one is IT DOESN'T STAIN. A red that doesn't stain?! Lawd hammercy. However, formula was a bit thin which can lead to cuticle flooding so be careful. 2 coats. Final thoughts: While I'm not big on fall colors, this collection is diverse enough to be worn during the fall and any other season. My picks: Aggie & Estelle. What's your favorite color to wear in the fall?